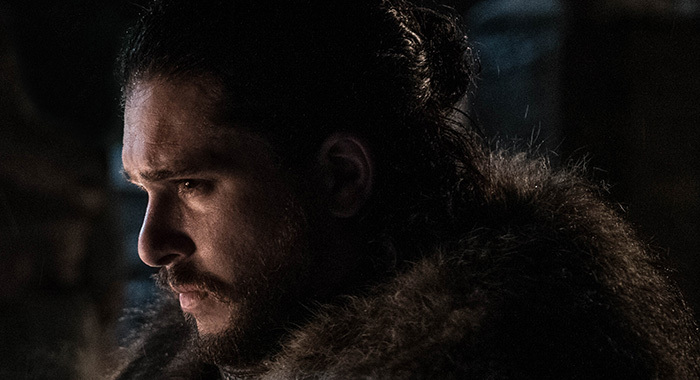 The title of Game of Thrones’ season 8 Episode 1: “Winterfell” 97% was kept secret right up to the premiere on Sunday night. 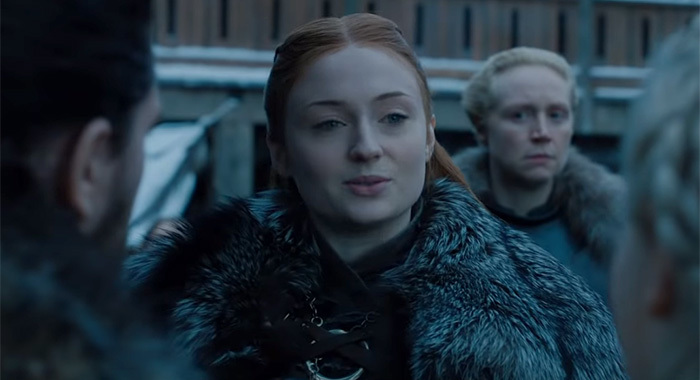 It’s not like that title is a spoiler — we knew from the season 7 finale and from the first trailers that this ride was “Next stop: Winterfell. ” Did anyone really think we were going to sail to White Harbor with the characters and brunch with House Manderly? Were you paying attention or were you making a cocktail in the kitchen and singing along with the theme song when the opening credits played? They took us inside Winterfell and the Red Keep to their depths. The credits have always been a foreshadowing to one degree or another. 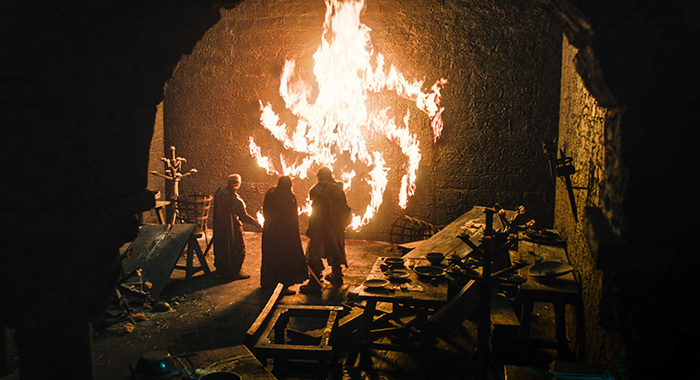 The season 8 credits first show the Wall destroyed, then a rolling motion to Last Hearth, a pause in that motion at the river between. The perspective then flows down to Winterfell, a journey down into the depths of the crypt, then an image of the astrolabe with a Lion with a fish in its mouth (remembering that Lannisters are the lions and Tullys are the fish – the only Tully left is Edmure, so what could that mean? ), a hung hound (THE Hound?) — or wolf — riddled with arrows, and what looks like the Night King with a wolf’s head and a dagger in his hand (if that’s a metaphor for Arya, I’m out, but maybe it’s literally a wolf, as both Nymeria and Ghost are still somewhere about). Next, to King’s Landing, where the Red Keep rises, as we descend into its depths. Where Balerion the Black Dread’s huge skull faces down the ballista (or “scorpion”) that Cersei shot at it. Up to the throne room, where a lion rises above the Iron Throne, then back to the astrolabe where a four dragons and a shooting star (with what appears to be a dragon’s head) fly over uncertain geography (or are those skinny horses?). 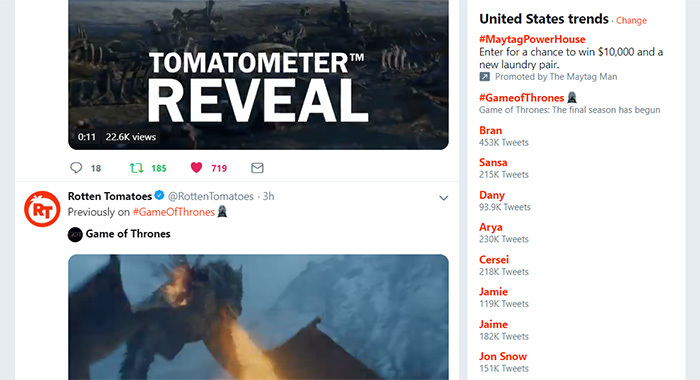 The main title is still surrounded by dragon, a lion, a wolf and a stag (with only one antler, it seems – Gendry?). The credits then reveal that the episode was written by Dave Hill and directed by David Nutter. 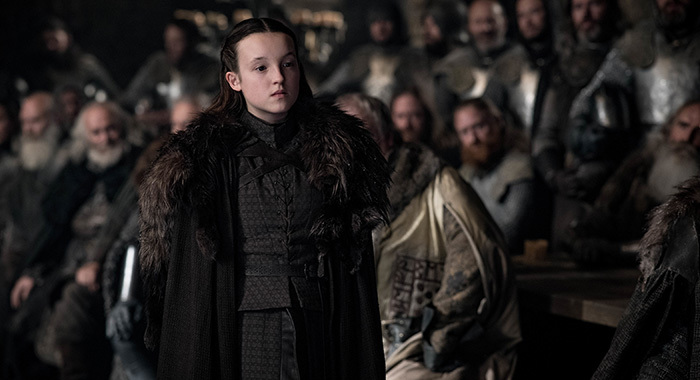 Then, convening with the North’s bannermen, Tyrion Lannister (Peter Dinklage) attempts to soothe the concerns of Lyanna Mormont (Bella Ramsey) and smooth over tensions in the room, but makes matters worse mentioning how many men and beasts came with Jon and Daenerys. 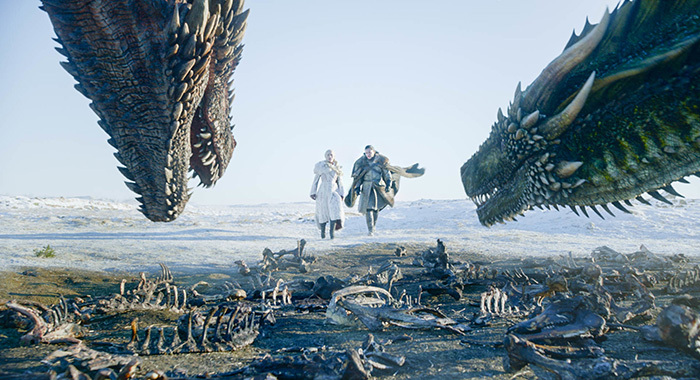 Jon accompanies Daenerys (after she notes that his sister doesn’t like her), ostensibly to see what’s wrong with Drogon and Rhaegal, who aren’t eating as much as they should. 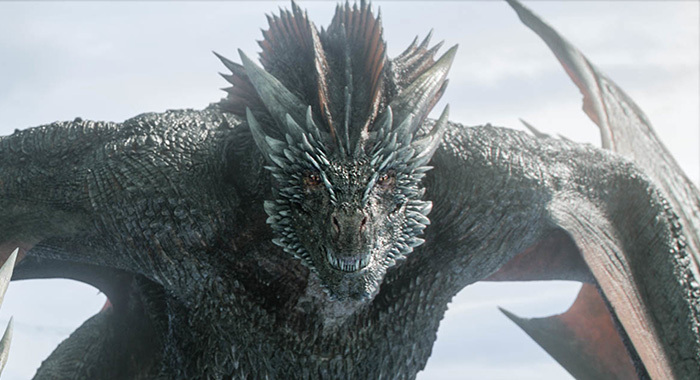 She climbs up on Drogon and prompts Jon, “Go on,” after Rhaegal noses at him. “I don’t know how to ride a dragon,” he warns. 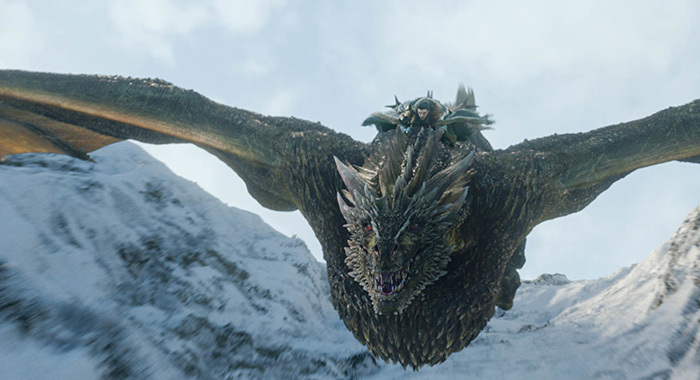 She replies, “Nobody does – until they ride a dragon.” He: “What if he doesn’t want me to?” She: “Then I’ve enjoyed your company, Jon Snow.” He successfully mounts the dragon: “What do I hold onto?” Daenerys: “Whatever you can.” Varys, Tyrion, and Davos’s mouths drop to the ground when they see Jon do a fly-by of Winterfell on Rhaegal, who does not make it easy on his rider. 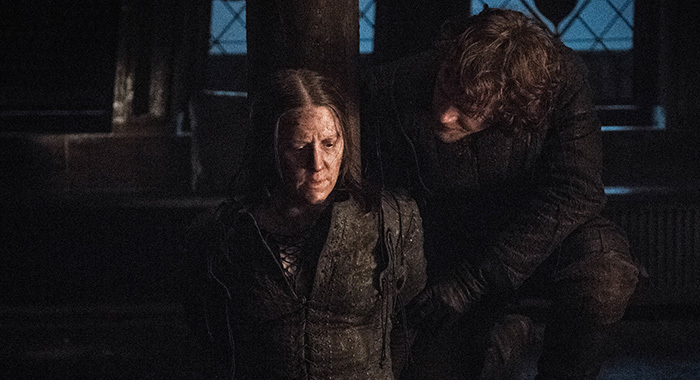 Daenerys ventures into the Winterfell library escorted by Ser Jorah to thank Sam for saving her advisor. 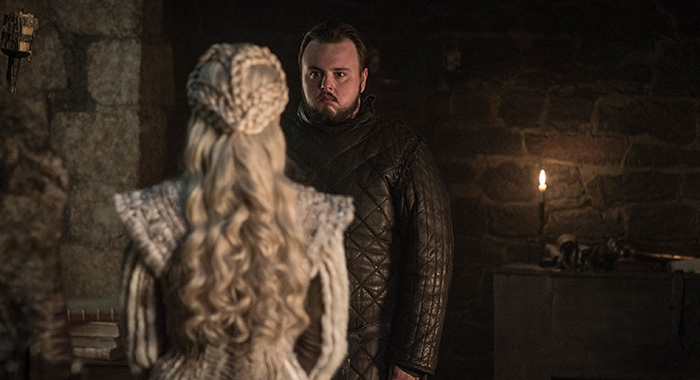 When he gets to the part where he mentions he’s a Tarly, Daenerys does the right thing and begins telling him that his father wouldn’t bend the knee. Before she can fully confess, Sam guesses the rest, but then stumbles again when she notes that his brother stood with his father. 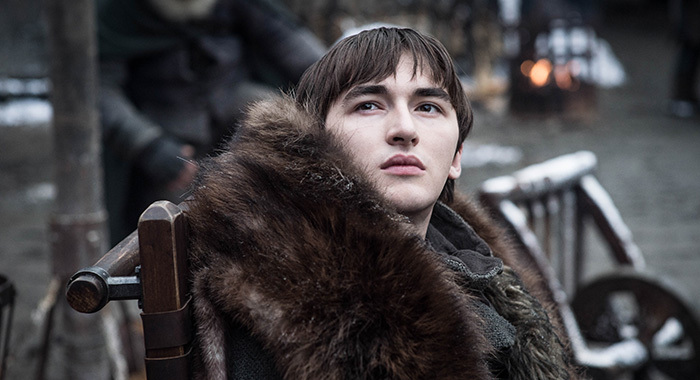 Viewers had to be grateful that Sam is a smart guy and guessed what happened before Daenerys had to get into specifics. It was awkward and really uncomfortable, but a highlight because it had to be done, and she accepted her role and began to confess it as soon as she made the connection. 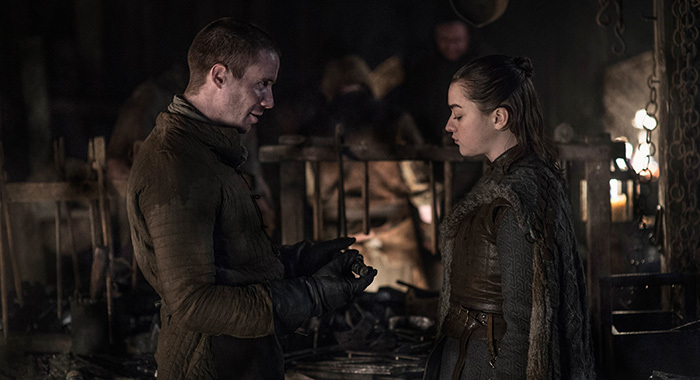 Some other stand-out moments: Tyrion’s reunion with Sansa, who promptly questions his smarts; Qyburn approaches Bronn to kill Jaime and Tyrion; Cersei awards Euron his prize and he offers to put a prince in her belly; Arya’s exchanges with Jon and The Hound; and Arya flirting — flirting — with Gendry.